Hear the Music but Feel the VYBE! VYBE Entertainment is a Professional Mobile DJ & Karaoke Service that look to meet all of our customers needs regardless of Genre requests. Hear the Music but feel the VYBE! VYBE Entertainment Was Established In January Of 2009, Two Guys With A Vision Of Entertaining People Were Able To Come Up With The Name VYBE. Why do you ask? Well the name stands for Variety of Your Best Entertainment which reaches exactly the markets we look to service. VYBE Entertainment is a Professional Mobile Disc Jockey & Karaoke Service. We strive to meet all of our customers needs regardless of genre requests. VYBE has recently added as of January of 2015, Live Internet Radio Broadcasts to an ever-growing listener following. ​Check out our Services with videos available to watch. We meet our customers where they need us to make scheduling much easier. 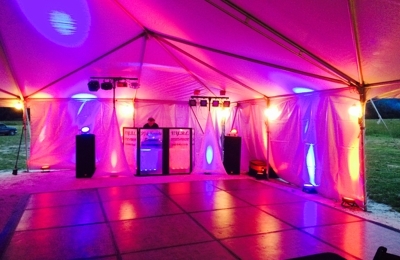 VYBE Entertainment recently DJ'd our middle school dance party (grades 6th-8th). James and his co-worker were punctual, profession, and great with the students. They got our kids up and moving, interacted with our students, and kept them dancing all evening! Their lighting and sound quality was perfect for our gym setting, and James did an excellent job with announcements and song selection/requests. Our school would love to have him back! Thank you VYBE! Vybe entertainment met with us a week before our wedding to go over everything with us. He was amazing, definitely better than I could have imagined. We asked for certain things to be done and he delivered past our expectations. Made it fun for everyone, he made my wedding what it was fun, relaxing, and enjoyable. If you are looking for a DR to do that for your wedding then I would Highly recommend this company! VYBE always rocks the house. Very talented DJ. I highly recommend. My wife and I chose VYBE Entertinment for our wedding on 10/03/2015. The DJ (James) meet with us personally prior the the wedding and worked out every last detail. The day of the wedding was great James had my entire reception hall rocking and we never had a single complaint. VYBE entertainment treated us and our event with the utmost professionalism. I would recommend them to anyone with a need for a DJ! We hired VYBE Entertainment for our wedding 8/8/15 it was the best decision we ever made!! Our wedding was no easy task as it was outdoors in a barn with fields around. James never hesitated with anything we needed! The entire event was run so professionally and had the barn rocking!! I would highly recommend hiring them for any event and would hire them again myself!! James and Mike rock!! I strongly recommend VYBE for any event. Wedding reception, company party, school event, you name it these guys will rock the house! From the vast music selection to their overall professionalism nobody and I mean NOBODY can touch VYBE Entertainment. VYBE Entertainment was amazing! My husband and I hired them for our wedding. They did a wonderful job and made our reception a blast! People were able to request songs and their song selections were fantastic! I highly recommend them and definitely would hire them again!